Big Blue just sent its famed AI to eight universities to beef up its security skills. IBM (NYSE:IBM) recently announced that Watson, its cognitive computing system, will undergo cybersecurity training at eight universities during a year-long research project starting this fall. IBM states that students and faculty will participate in research to train Watson in "learning the nuances of security research findings and discovering patterns and evidence of hidden cyber attacks and threats that could otherwise be missed" by security analysts. The company claims that those improvements will help "address the looming cybersecurity skills gap." IBM's Watson Knowledge Studio being used to train Watson in cybersecurity. Image source: IBM. This isn't the first time IBM has sent Watson to school. IBM previously sent Watson to hospitals to analyze big databases of personal health data to help doctors, researchers, and insurers make more informed decisions. It also recently partnered with Sesame Workshop, the nonprofit educational organization which produces Sesame Street, to develop educational platforms and products which "adapt to the learning preferences and aptitude levels of individual preschoolers." Back in 2014, IBM set aside $1 billion to create a new business unit for Watson staffed by around 2,000 employees. Since then, the unit has grown to 5,000 employees, mainly due to its acquisitions of the Weather Company, Truven Health Analytics, Merge Healthcare, and other analytics-related companies. 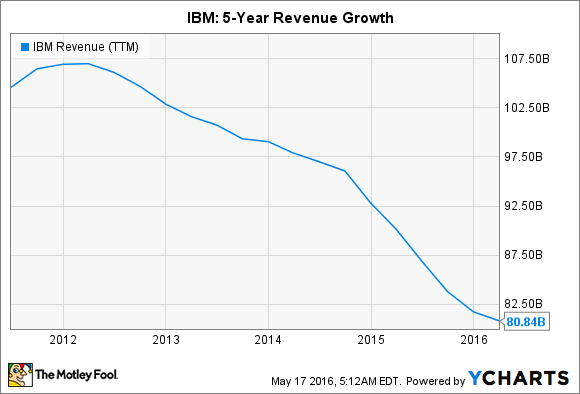 IBM has refused to disclose exactly how much revenue the unit actually generates. Bernstein Research analyst Toni Sacconaghi estimates that Watson only generated $200 million in revenue in fiscal 2015, which would account for just 0.2% of its revenue from continuing operations. Watson is currently part of IBM's Cognitive Solutions unit, which generates most of its revenue from security and analytics solutions. Revenue at that unit fell 1.7% annually to $4 billion last quarter. During last quarter's conference call, IBM stated that the Watson ecosystem was expanding at a healthy rate, with the number of developers using its APIs surging more than 300% over the past 12 months. IBM also reported that the number of enterprises that Watson had engaged with doubled, and that its solutions are being used and deployed in more than 45 countries and across 20 different industries. IBM likely knows that if it doesn't nurture Watson's growth, it will fall behind other challengers in the cloud and machine learning market. These rivals include Microsoft's (NASDAQ:MSFT) Azure ML (machine learning) platform, which is integrated into its Azure cloud platform, and Amazon's (NASDAQ:AMZN) Amazon ML platform, which connects to its AWS (Amazon Web Services) platform. IBM's Bluemix. Image source: IBM. Since IBM's comparable Bluemix cloud platform is much smaller than AWS and Azure, it needs Watson to establish specialized roots in certain industries, like healthcare and cybersecurity, for its cloud business to stay relevant. Otherwise, companies could simply stick with Microsoft or Amazon's bundled ML solutions for the sake of convenience or pricing. IBM's revenue has fallen annually for 16 consecutive quarters due to sluggish enterprise spending, weak demand for its IT services, and unfavorable currency exchange rates. However, IBM has been investing heavily in the growth of its "strategic imperatives," which include its cloud, analytics, and engagement businesses. Revenue from those units rose 14% annually last quarter and accounted for 37% of Big Blue's trailing 12 month sales. Watson doesn't generate much revenue on its own, but it weaves a common machine learning thread through IBM's strategic imperative units. If IBM can prove that Watson Analytics is superior to Amazon ML, Azure ML, or other cognitive challengers in big industries like healthcare, cybersecurity, or the Internet of Things, it can widen its moat against potential rivals. IBM's enterprise partnership with Apple, which delivers IBM cloud apps on iOS hardware to businesses, can also complement its growth in machine learning and help it disrupt Microsoft's attempts to tether Windows to Azure. IBM's decision to send Watson to cybersecurity school is a good strategic move, since demand for cybersecurity services is rising, but it probably won't matter much to Big Blue's finances. Instead, it should be considered a defensive move against Amazon and Microsoft, which might help IBM become a "best in breed" cognitive learning player in the cybersecurity market. Therefore, it wouldn't be surprising if IBM starts buying up cybersecurity firms to broaden Watson's cybersecurity capabilities, just as it scooped up healthcare analytics firms to bolster its ability to read and analyze patient files.